I have just walked round to my friendly neighbourhood printer (Trojan Press in Blackheath, London SE3) to collect my new batch of business cards. Proprietor Dave tells me that I am the first customer he’s had who has their Twitter ID on the card! I was a little surprised, as I have been including my Twitter ID on communications – eg: on my email footer – almost since I started using Twitter last spring, and at recent events, I’ve gathered a few cards with Twitter IDs. However, looking back, these all came from two blogger/social media events I attended. Not surprisingly, the construction meetings and conferences I’ve been to haven’t yielded a single person proud to declare their Twitter-ness! I was going to run an online poll to see how many people put their Twitter ID on their business card. However, Dennis McDonald has already set one up, asking four simple questions. The results, as at 27 February, showed just over a quarter of business card holders included their Twitter ID, but this figure probably reflects the large proportion of self-employed people in this (small and self-selected) sample. I now try to put my Twitter ID on items I hand out or in slide presentations. Lately, I have been getting business cards printed at Moo Cards (http://www.moo.com) They are very nice and can be customized with the whole design being done online. Of course they are located in the UK – you English have all the innovative, cool things. Thanks, Pam. Yes, several of the cards I received were done by Moo – including three of their mini-cards. The Moo blog says they plan to open a USA operation later this year, in Providence, Rhode Island. Here’s an alternative for you – Contxts. The basic idea is you leave all your information with Contxts then when you meet someone you want to share with either they text a number with your name, or you can text and tell Contxts to send your details to that person. Not sure if you can use it in the UK but it sounds like a good idea. Unless you’re Trojan Press. 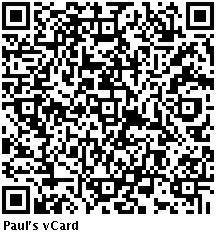 I have an iPhone and am using beamME to beam a Vcard to an email address, US mobile number, or @Twitter. The standard iPhone field option doesn’t have a place for Twitter (NB: Apple), but I added a custom field as an email address. And yes, my new business cards will have @nextmoon listed.